We hope that this steps contributes to a better mobile experience in the long term beginning today, April 1st 2019. My last post shows how to create a stub Python/Kirigami app that doesn’t do anything. Time to change that! In this post we’re filling the screen with some controls. Kirigami apps are typically organized in Pages. Those are the different ‘Screens’ of an app. If you come from the Android world you can think of them as the view part of activities. In our case we want to have an initial page that offers to enter a stop or a destination and opens a new page that shows a list of possible routes. Clicking on one of the list items opens a new page with a detailed view about the connections. Pages are organized in a pagestack where pages can be pushed and popped. On a phone only the topmost page is shown, whereas on a larger screen (desktop or tablet) multiple pages can be shown next to each other. Time to fill it with some content. A ColumnLayout is a component that positions its children vertically. We set it to be as wide as its parent, the page. The TextFields shall span the whole width as well. Instead of using the same ‘width: parent.width’ we are using ‘Layout.fillWidth: true’. This property is only available to children of a Layout. The difference to the first way is that all the width that is not already occupied by other elements in the layout is filled. Now our app looks like this. Both buttons have the “Layout.fillWidth” property set to true, resulting in each one getting 50% of the space. You can force the mobile view on the desktop by setting the QT_QUICK_CONTROLS_MOBILE variable to 1. Right now it’s just an empty page, we’re going to fill it with life in the next post. You can find the full source code for all posts on Git. KDE is happy to announce that we will be part of Google Summer of Code 2019. GSoC is a program where students recieve stipends to work on free software for 3 months. Getting paid for open source work, that’s the dream, right? KDE Connect builds and runs on Windows, but there are a lot of things that can be improved. This mostly involves the functionality that makes use of notifications. A large part of this task is about improving KNotifications on Windows. Scanning a barcode is one of those tasks that comes up in various different apps but the developers don’t want to implement it themselves. For those kind of tasks we have the Purpose framework in KDE. It allows the developer to specify a desired action and let the user choose from available services to fulfil them. E.g. the Share feature in Dolphin is implemented via Purpose. This task is about adding a new action type to Purpose that allows to scan a barcode. Possible implementations could use the local camera or the camera of a device connected via KDE Connect. If you are interested in doing one of those tasks and have some basic understanding of C++ please contact us on #kdeconnect on Freenode or on Telegram. The deadline for student applications is April 9th and composing a good application takes some time, so please contact us rather soon. One app that is essential for my use case is an app that allows me to check departures and routes for public transport. Since I’m not aware of any existing one I decided to do my own and share my road here. The purpose of this is to be educating for both me and you and to inspire you to create your own mobile-friendly Linux apps. Like the other KDE mobile apps I’m going to use QML/QtQuick and Kirigami. QML is the declarative UI language from the Qt project. Unlike the older QWidgets it is designed with (embedded) touch systems in mind and thus is ideal for mobile apps. Kirigami is a set of QtQuick components designed for creating convergent mobile/desktop apps. Unlike other KDE projects I’m not going to use C++ for the business logic. Instead I’m going to use Python, which is now officially supported by Qt. Since my Python skills are fairly basic this will be a fun challenge for me. Therefore take everything I write with a grain of salt and feel free to point out anything that is wrong or can be improved. This won’t be a 100% complete reference for developing for Plasma Mobile, but I’ll try to cover as many different aspects as fit into the concept of this app. I’ll also try to focus on one aspect/feature/goal per post. Also most of this will not be specific to Plasma Mobile but will work on any desktop or mobile Linux. Before getting started we need to install a few things. First of all we need Python (obviously) and Qt for Python. Qt for Python was formerly known as PySide2. You can install it via ‘pip install pyside2’. Next there is Kirigami. On Ubuntu you can install it via ‘sudo apt install qml-module-org-kde-kirigami2’. After that we can start coding. The following main.py file is creating an app and loading the UI from a .qml file. The exact details are not too important at this point. Today we released version 1.10 of the KDE Connect Android app. Therefore it’s time again to share what we’ve been working on. As of this month app updates uploaded to Google Play need to target Android 8. This has several implications. Targeting Oreo comes with an updated Support Library, which forces us to drop support for Android 4.0 and below. According to our Google Play data this will affect approximately 400 users. We are very sorry about that, but these users won’t receive further updates. Furthermore, Android Oreo introduced some restrictions in regard to apps running in the background. In the future in order to be able to run in the background KDE Connect needs to show a persistent notification. The good news is that you can hide the notification. The (slightly) bad news is that we cannot do it by default. To hide the notification you need to long-press it and switch it off. Other notifications from KDE Connect are unaffected by this. These are the main changes of version 1.10. Not mentioned are countless small improvements and under-the-hood changes. Mouse input now works with the same speed independent from the phones pixel density. The media controller now allows stopping playback. Run command supports triggering commands using kdeconnect:// URLs. Useful for integration with NFC tags and 3rd-party apps. The notification filter allows quickly (de-)selecting all apps. Several settings scatterd across the UI have been bundled into a single settings screen. The desktop side has improved as well since my last post. The windows build of KDE Connect gained support for keyboard input. The plasmoid gained a couple of additions. In my last update I mentioned that it is possible to run commands from there. It is now also possible to lauch the command setup from there. Furthermore it is now possible to select files to share them from there. The Linux Mobile App gained many visual improvements and features. It now supports sharing files and controlling the system volume. If you are using Itinerary you can send booking information from the PC directly to the phone via KDE Connect. It is now possible to send files directly from Pantheon Files (and other Elementary apps) and Thunar via KDE Connect. Again, there are countless other improvements that I did not explicitly mention. A big thanks to all people who contributed to this! Since a few months KDE Connect has a Telegram group to discuss development. Since the over 100 people joined. I did not expect such an interest in it. Few people asked to have this group bridged to an IRC channel since they prefer IRC over Telegram. I’m happy to announce that we finally made this happen. Let’s celebrate the birth of #kdeconnect on Freenode. You can also access it from matrix.org (#freenode_#kdeconnect:matrix.org). The rest is up to you! If you are interested in contributing to KDE Connect go and share your ideas with us and ask any question you have! It’s time for another feature update for KDE Connect! You can now run commands on connected devices from the Plasmoid. The Dolphin context menu entry for sending files to a connected device has been dropped in favour of a Purpose plugin, which groups nicely with other Share features and supports more apps such as Okular and Spectacle. Albert Vaka added a presentation mode to Android which allows you to control slideshows from your phone. Aleix Pol added the same to the Kirigami app. As I’ve mentioned before it is quite hard to find the settings where you can define your commands for the Run Command feature. The command list on Android now has a button that opens the appropriate settings on the desktop. Ivan Čukić added a few useful command suggestions to the menu. Friedrich Kossebau added support for a “Find my PC” plugin. You might wonder now how often he loses his PC, but it also helps finding other devices that run the C++ version of KDE Connect, such as Plasma Mobile and SailfishOS devices. I added support for triggering it on the Android side. Following a request on Reddit I added a dedicated Stop button to the media controller. Chansol Yang made sure that the pointer speed when controlling the mouse from the phone is the same across Android devices with various DPIs. Philip Cohn-Cort added the much requested dark theme option to Android. You can now use special URLs to trigger commands on connected devices. The urls have the form kdeconnect://runcommand/<deviceid>/<commandid>. As those are quite complex I added a helper for it. You can copy an URL to the clipboard by long-pressing a command in the command list. You can write those URLs into a NFC tag to trigger the command when your phone reads the tag or use it to integrate with services such as Tasker. The system volume patches have been merged. To make use of it you will need the latest KDE Connect from master for Desktop and Android and pulseaudio-qt installed. You can get pulseaudio-qt from git. We will to an initial 0.1 release soon and hope that distros will ship it soon. Besides these features we also fixed some bugs and polished the UI a little. Bluetooth support is progressing slowly. Matthijs Tijnk and Qt 5.11 fixed some issues. However, it is still not ready for the public. Aleix and I improved the Kirigami app. We improved the basic pairing workflow and you can now run commands and control media sessions. Bart Ribbers fixed an issue that was blocking KDE Connect from building it for postmarketOS. I hope to see KDE Connect there as well! 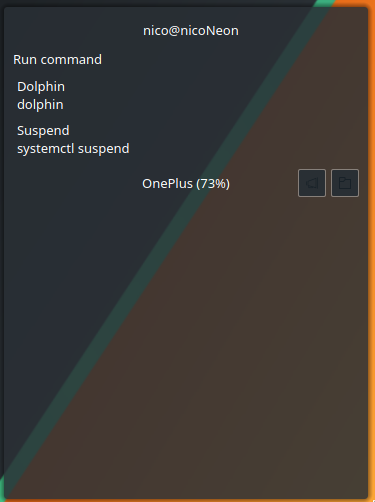 Adam Pigg made a huge step towards bringing KDE Connect to Sailfish OS. We like to see KDE Connect on as many platforms as possible, and we need your help for it! Our workboard contains lots of ideas for new people to get started. You can ask for any assistance in our Telegram group.